From the moment, your new swimming pool is installed and filled with fresh water, proper care must be taken to ensure algae or other organic contaminants don’t accumulate. In addition to proper filtration and regular cleaning maintenance, the addition of chemicals is essential to keeping your pool sparkling clean. This section serves to introduce you, to chemicals used in swimming pools, and to the testing and addition procedures required to maintain the levels of those chemicals. Each major chemical is defined in detail, along with the various testing and addition procedures, and some basic troubleshooting guides. While the information contained in the following guide is comprehensive, it’s recommended that you visit the pool professionals at your nearest Pool Supply Store regularly to stay up to date on the latest swimming pool treatment and techniques. Have your pool water thoroughly tested by their computerized testing facilities. Chlorine and pH, are considered the “basics”, and explained in detail, as well as total alkalinity, conditioner, water hardness, and Total Dissolved Solids (TDS). The most common metals (other than calcium), copper and iron, are also discussed. A thorough investigation into the major types of algae is presented. The section is concluded with an introduction to the first few weeks of swimming pool care. For maximum effectiveness, chlorine requires a proper pH balance. Acid / Soda Ash Demand Test measures the pH level of the pool water. Maintain proper pH for chlorine effectiveness, the prevention of staining and scaling, and corrosion of finish and equipment. It’s necessary to maintain the proper level of total alkalinity to achieve the ideal pH balance. Total alkalinity acts as a buffer and creates the stabilization required to support an ideal pH balance. To prevent scaling of the pool equipment and finish maintain the calcium hardness within the ideal range. Once the hardness reaches 600 ppm, the pool should be drained completely and refilled. This chemical (cyan uric acid) prevents the sun’s UV rays from depleting free chlorine. It creates a “conditioned” stable environment for maximum chlorine effectiveness. Please note Salt Systems can ruin the rock around your swimming pool. Proper testing and care insure years of pool use, although neglect can cause serious problems and needless expense. Algae, stains, and scaling can be prevented. The constant control of chlorine, pH, alkalinity, and hardness are essential to the prevention of bacteria, scale, and corrosion. Your pool will differ from your neighbors’. Differences in size, water temperature, and usage make each pool unique. Don’t compare your pool to others. To Keep the pool water free from contaminants, it’s necessary to add a chemical, which can kill algae before it becomes visible, or a health hazard. As a rule, the presence of algae in water does not pose a significant risk to health, but it can enter open cuts or sores and cause an infection. Once the concentration of algae in the water becomes great, it’s visible to the naked eye as discolored water or blemishes on the pool surface. At this stage A more drastic measure than just the routine addition of chlorine or some other water disinfectant will be required. Approaches to visible algae control are covered in the last section of this section. The most common type of water sanitizer, chlorine, will be covered in detail, along with its testing procedures, and some troubleshooting guides. Before discussing methods of using chlorine, some basic terms must be introduced. They’ll be presented in a “dictionary” format, and will include pronunciation guides when necessary. The total amount of chlorine, in any form. Dissolved in the pool water. It’s measured in parts of chlorine per I million parts of water (by volume), and the measurement is abbreviated a ppm (parts per million). Total chlorine can be tested directly with an ordinary test kit. The amount of chlorine in the pool water, which is chemically combined with organic waste matter. This matter need not be algae, and in fact, could include one or more of the following: suntan lotion, body oils, sweat, and other body fluids. While these materials are organic, they don’t cause visible water discoloration at normal concentrations. They do, however, prevent chlorine from effectively destroying algae. Combined chlorine is measured in ppm, but is not tested directly. To find the level of combined chlorine in the pool water, subtract the free chlorine level (see below) from the total chlorine level. The amount of chlorine in the pool water, which is active and available to effectively destroy algae. The free chlorine level is the most important chlorine test level, and can be tested directly using a deluxe home test kit or at your nearest Pool Supply Store. Any form of chlorine, which is neither a liquid nor a gas. Dry chlorine is available in tablet or granular form. cardboard boxes containing two or more gallons. Liquid chlorine should not be confused with chlorine bleach, such as Clorox, as it’s several times stronger than bleach. Gas chlorine can either be added directly to the pool water, or it can be manufactured from ordinary salt in a chlorine generator such as the Chlorine Factory. In the long run, it’s the least expensive of all three types of chlorine to use, but only the generators can be used by the pool owner. Direct injection of gas chlorine is done only by qualified and licensed pool care services. Chlorine is present in nature as a gas, and because of this it contains no fillers or by-products. Chlorine is manufactured in three different types: dry, liquid, and gas. Dry chlorine is made both in a tablet form and granular form. Liquid chlorine and gas chlorine each are made and sold in one form. All types of chlorine, which are available to swimming pool owners, are discussed in this section. tablets are usually made in two different sizes: 3-inch and l-inch diameters. Both sizes are available since each requires a different method to introduce them into the pool water. 3-inch tablets are by far the most common size of chlorine tablets. They dissolve very slowly, and are generally available at a lower cost to the customer. Both facts make 3-inch tablets far more cost effective than their l-inch counterparts. 3-inch tablets can be introduced to the pool in a variety of ways. They can be used in an in-line chlorinator or a floating chlorinator. Purchased by the bucket at Sam’s, Walmart, Home Depot or Lowe’s with be the most cost effective. l-inch chlorine tablets are smaller, and thus dissolve faster than 3-inch tablets. This’s advantageous in the case where there is relatively low water circulation, or if the only available method of introducing chlorine into the pool is the floating chlorinator. Since there tends to be very little water movement in floating chlorinators, and erosion of the tablets depends on water movement, the faster-dissolving l-inch tablets would be the chlorine form of choice. Both l-inch and 3-inch tablets are made from the same type of chlorine, thus they have equal strength. The only difference lies in the size of each tablet. if installed or your skimmer basket. Dry chlorine is also available in granular form. The types of granular chlorine vary in strength, and care should be taken in choosing the strength that best suits the swimming pool’s needs. Sodium Dichlor is granular chlorine intended for concrete, Vinyl-Lined, and fiberglass swimming pools and cold-water spas. Since the content is 62% available chlorine, it’s not powerful enough to damage these surfaces. The use of Sodium Dichlor in plaster pools and heated spas is not recommended due to the relatively higher cost involved in maintaining an ideal chlorine level. NOT TO BE USED IN COLORED PLASTER OR PEBBLE TEC FINISHES! Trichlor is the most powerful dry chlorine available. It contains 89% available chlorine and contains conditioner, which, as explained in a later section, helps to increase the life of the chlorine once it has dissolved in the water. Because of it’s high strength, trichlor cannot be used in vinyl-lined or fiberglass pools or fiberglass spas. If used in one of these environments, the- trichlor would damage the lining of the pool or spa, causing leakage and discoloration. However, it’s higher concentration of available chlorine allows for smaller doses and longer times between applications, thus making it more cost effective than Sodium Dichlor. Calcium Hypochlorite is another type of granular chlorine. As its name suggests, it contains calcium, a mineral that can cause scale buildup on the tile and the pool surface. For this reason, it’s not recommended to use Calcium Hypochlorite on a regular basis as a primary source of chlorine. It’s, however, widely used for super chlorination. This use is acceptable since super chlorination is only done periodically. However, prolonged or excessive use of Calcium Hypochlorite for super chlorination can result in scale buildup (see later section on super chlorination). Liquid chlorine is a very common type of chlorine used in swimming pools for super chlorination and algae removal. Because it contains only 10% available chlorine, and it contains no conditioner, it’s not advisable to use liquid chlorine as a primary source of chlorine for the pool. It’s, however, an excellent choice for super chlorination, and is relatively inexpensive. It dissipates within 12 to 24 hours, allowing use of the pool in a very short time. Liquid chlorine is sold only in one-gallon containers and is usually packaged with two gallons in one box. It does not have a long shelf life (about 2 weeks), and thus should not be stored for future use. Gas chlorine is the purest form of chlorine available. Since chlorine occurs naturally as a gas, it contains no by-products, and thus contains 100% available chlorine. Gas chlorine can be added to the pool in two ways: it can be directly injected into the pool water from a storage container, or it can be manufactured from salt using a chlorine generator. The latter method is available to the consumer, but direct gas injection can only be done by licensed pool service technicians. In-line chlorinators are those, which are installed with the piping network of the swimming pool equipment. They hold either 3-inch or l-inch tablets and have regulator valves to control the rate at which the chlorine dissolves. This allows for longer times between applications of chlorine and keep the chlorine away from the reach of children and animals. Floating chlorine dispensers are available in a variety of shapes and sizes, and sometimes are in the shape of decorative animals such as ducks and swans. In some cases, they are pre-loaded with l-inch tablets and are disposed of when empty. Others are refillable, allowing the use of either 3-inch or l-inch tablets. 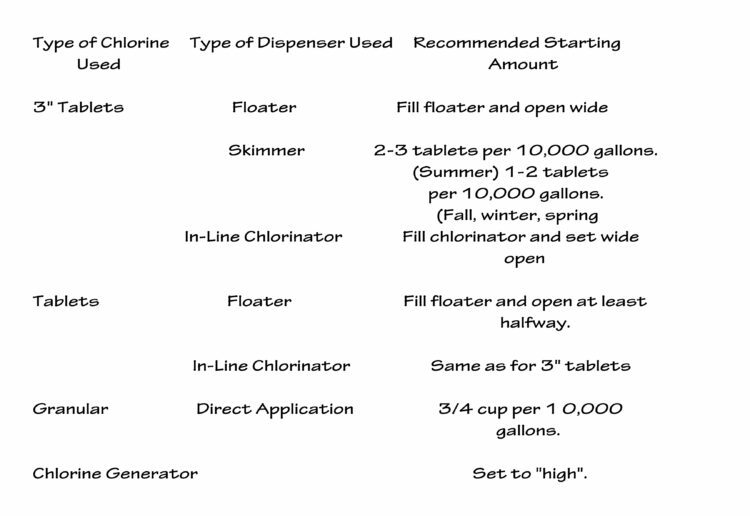 In some cases, the chlorine demand for a certain pool is greater than the output of a single floating chlorinator. In. these special cases, the best alternative is to use more than one floater, or to use the faster dissolving l- inch tablets. Contrary to some opinions, the pool’s skimmer is a perfectly acceptable place for chlorine tablets. The high-water flow in the skimmer provides excellent erosion of 3-inch tablets, and the plastic construction of today’s modem skimmers are not subject to corrosion by chlorine. In addition, PVC pipes, thermoplastic pumps, and fiberglass filters do not corrode in the presence of chlorine. However, copper heating elements and other metal objects found in some pool filtration systems may be corroded and have decreased life due to high concentrations of chlorine. In these cases, it’s advisable to use one of the other two methods described above. Direct chlorine application applies only to granular and liquid chlorine use. The only way to add granular or liquid chlorine to the pool water is to evenly sprinkle it over the water surface. Because of the harmful fumes and chlorines tendency to irritate skin, granular and liquid chlorines are generally rejected in favor of tablets. An alternative to directly adding chlorine to a pool using either tablets or granular chlorine is to generate the chlorine from ordinary salt, which is made from sodium and chlorine. Two methods are most often employed. The first is to add salt pellets into a chamber of a special chlorine-generating unit, such as the Chlorine Factory. The salt is mixed with water and a small electric current separates the sodium from the chlorine. The chlorine is injected into the pool through a series of hoses, and the sodium is kept in a separate chamber for later disposal. After about 2 weeks, the sodium is removed and more salt is added. The other method involves the addition of granulated salt directly into the pool water. As it circulates through the filtration system, a special unit adds a small electric current to the mixture and the sodium and chlorine are separated and added simultaneously to the water. There is no sodium by-product to remove, and a small amount of salt is added to the pool about twice a year. With this process your natural rock surfaces near or around the swimming pool will erode and appear to be melting over time. If you decide to use a salt system, it’s imperative to seal all natural stone twice a year to lower the chance melting. To ensure the proper amount of chlorine is in pool water, the water must be tested regularly. It’s assumed that at least a standard pool water testing kit is present and the instructions for the kit have been read and understood. The concentration of chlorine in water is measured in parts per million (ppm), that is, parts of chlorine per one million parts of water. A standard test kit is graduated on one side from zero ppm to 3.0 ppm, although the concentration can be much higher than 3.0 ppm. Once the chlorine vial in the test kit is filled with pool water. The proper number of drops of OTO (or tablets of DPD, for those test kits using such a chemical) are added to the sample, the color of the sample should change in the presence of chlorine. That is, if chlorine is present in the pool water, the color of the sample should change to a shade of yellow (or pink DPD test tablets are used). The next step is to match the color of the sample with one of the colors corresponding to the chlorine concentrations on the test kit. If the color of the sample matches that of one of the concentrations on the test kit, the number corresponding to that color is the amount of TOTAL chlorine in the swimming pool (in the case DPD test kits. the color of the sample after adding DPD #1 is the FREE chlorine, and the color after adding DPD #3 is the TOTAL chlorine). Most test kits are labeled with an “ideal” level for chlorine, usually between 1.0 and 1.5 ppm. While this level is adequate for most pools, it’s recommended to maintain a higher chlorine concentration than this during the hot summer months. Thus it’s recommended that a concentration of 3.0 ppm be maintained during the warmest summer months. This ensures that the minimum level of 1.5 ppm is present and provides additional chlorine to combat the additional organic wastes present due to the increased pool use. Since each swimming pool has different chlorine requirements, it’s difficult to recommend the precise number of tablets, etc., that are required to maintain a 3.0 ppm chlorine level. Par this reason, it’s advised to experiment with a pool to determine its requirements. As a starting point, use the guide above. Allow the system to circulate for 24 hours, and then test the chlorine concentration. If the level is too high, decrease the amount of chlorine used, or decrease the setting of the chlorinator (i.e. Close floater slightly, or set generator to “med”, etc. ), If the level is too low, add more tablets or granular chlorine, add another floater, or supplement using an additional method (i.e. use the skimmer and a floater, etc.). During the summer months, a swimming pool must be tested at least once a week, since the levels of chlorine and pH can vary dramatically within a matter of hours. Since the chlorine and pH are the two tests of primary interest, these are the only two, which must be tested daily. The other tests, such as alkalinity, hardness, etc., are tested on a weekly and/or monthly basis, as discussed in later sections. As the outside temperatures decrease, the frequency of testing can decrease also. In other words, during non-summer months, testing for chlorine and pH can be done twice per week or even once per week in the coldest winter months. During the middle of the afternoon, the temperature is warmest and the sun is usually able to shine into the water easiest, and it’s now that algae grows most rapidly. Thus, this is also the time when the chlorine level should be at its highest, since it will be necessary to prevent the rapid spread of algae. It is for this reason that it is recommended to test the pool water during the warmest part of the day (i.e. between the hours of 3:00 pm and 5:00 pm). If the chlorine was tested at 9:00 in the morning, and the level is 3.0 ppm, it’s entirely possible that the chlorine concentration may decrease dramatically, say to 1.0 ppm before the warmest portion of the day arrives. Therefore, an ideal chlorine level in the morning may not necessarily mean an ideal level in the afternoon, when it’s needed most. If an ideal 3.0 ppm level is noticed at 5:00 pm, it can be assumed that it was at least that amount throughout the day, and the pool was properly protected against the spread of algae. Super chlorination refers to a process by which the chlorine level in the swimming pool is raised to abnormally high levels over a very short period, usually a few hours. Since this requires rapid addition of chlorine, slow-dissolving tablets are not suitable for super chlorination. Instead, special granular or liquid chlorines are used which are packaged in appropriate sizes and which do not remain in the pool water for an extended period, allowing the pool to be used as soon as possible. Another common mime for super chlorination is “shocking”. Over time and with extended use, organic wastes build up in the pool water. These wastes include body oils, sweat and other body fluids, and suntan lotions. Once these wastes are present, the chlorine begins to break them down, as it would any organic substance, which enters the water. However, since the chlorine is working to eliminate these organic wastes, it’s not available to eliminate spores of algae as they enter the water from the air. This can allow the algae spores to multiply, resulting in visible algae in a short period. It’s therefore required to increase the pool’s chlorine concentration rapidly to eliminate the organic wastes so that the chlorine is free to prevent the spread of algae. There are three basic methods of super chlorination. Shock-It, a convenient, one-pound package of chlorine has been formulated for this purpose, so that the pool can be used for swimming in a short period. One disadvantage of Shock it contains calcium, the main contributor of hard water, and because of this it’s not recommended for use in pools with hard water (see Section 6 of this guide). As a rule, one-pound bag of Shock-It is used for every 10,000 gallons of pool water. Liquid chlorine can also be used to super chlorinate a swimming pool. As with Shock-It it is unstabilized, but in addition, it contains no calcium, and thus it can be used in areas where hard water is a problem. Generally, 1 gallon of liquid chlorine is needed for every 10,000 gallons of pool water. In addition, swimming pools can get the effect of super chlorination without the use of a chlorine product. “Non-chlorine shock treatments”, as they are called, add active oxygen to the pool water in a granular form, they are generally non-toxic and non-irritating and thus the pool can be used as early as 10 minutes after application. This method is usually about twice the cost of standard chlorine-based super chlorination treatments, and one pound will treat 25,000 gallons of pool water. It’s recommended to super chlorinate a swimming pool every two weeks in the summer, when the pool is used more, and the possibility of the presence of organic wastes is great. During the off-season, once per month is sufficient. It’s also recommended that super chlorination take place in the evening, after the sun has set, since this is when the pool is not being used and the treatment will not be removed by UV rays from the sun before it can perform its function. Every substance has a pH: water, juice, dirt, leaves, salt, food, shampoo. These items have a certain amount of acid in them. The amount of acid in a substance is measured by the ph. Vinegar is also known as acetic acid. Citrus fruits and juices contain large amounts of citric acid. Baking soda contains a very small 1 amount of acid, and is thus referred to as a base, or alkali. In swimming pools, a certain pH range is required to ensure proper efficiency of other chemicals, as well as the comfort of those using the pool. Proper care must be taken to ensure that the pH of the pool does not reach a level which could be harmful to swimmers, or which could damage equipment or the pool itself. pH: pH stands for “power of hydrogen” and is so named because it’s the presence of hydrogen, which determined the acidity of a substance. The more hydrogen, the more acidic the substance is, and thus the lower the ph. It’s often a misunderstanding that as the pH increases this means that the amount of acid in the water increases, when in fact the opposite is true. Acid is a substance, either liquid or granular, which has the ability of lowering the pH of water. In liquid form, is quite concentrated, and thus only a small amount is required to lower the pH of an average swimming pool. Examples of common acids are muriatic (hydrochloric) acid, sulfuric acid, and sodium bisulfate (dry acid). A base is a substance, usually a granular product, which has the ability of raising the pH of water. Examples of common bases are soda ash and baking soda. Acid lowers the pH of swimming pool water. As a rule, the pH of pool water in Arizona tends to always increase, although there are a few cases where the opposite occurs. Therefore, acid is a commonly used chemical in Arizona pools. There are three different types of acids used in pools, and they will be discussed here, along with testing methods and some-other factors, which affect the pH level of the pool water. Muriatic is the most common type of swimming pool acid, and it’s also the strongest (most highly reactive) type of acid. It’s also called hydrochloric acid, as it is made of only hydrogen and chlorine. The highest concentration available to the consumer is only 38%, but even at this relatively low concentration it’s a very dangerous chemical. Care should be taken to avoid contact with the skin, clothing, and every ‘other surface capable of corrosion. Do not ever add water to acid. Sulfuric acid is one of the most commonly recognized acids in the public sector. it’s, however, a much less reactive acid than muriatic acid, and is therefore referred to as a “weak” acid. Because of this, it can be found in much higher concentrations, as high as 93%. At this concentration, one cup of sulfuric acid will do the same job as 1 quart of muriatic acid. Care should be taken to avoid overdosing of the swimming pool using concentrated sulfuric acid. Even though it’s less reactive than muriatic acid, the same care and precautions should be taken as with muriatic acid. Dry acid is a granular acid commonly used to lower the pH of fiberglass pools and spas, vinyl-lined pools, painted pools, and all pools whose surface could be damaged by strong liquid acids. Although it’s a relatively weak acid, it can be a powerful irritant and thus the same safety precautions should be followed as with muriatic and sulfuric acid. A base raises the pH of swimming pool water. In most cases, routine addition of a base is not necessary, but a small amount of one, such as soda ash, may be needed in case too much acid is added either by the user or by nature. Soda ash is a chemical usually granular, which neutralizes acid. It’s made from sodium, carbon, and oxygen, and can be as harmful and dangerous as acid, so care must be taken to avoid contact with skin, clothing, and anything subject to corrosion. Never add water to soda ash … always add soda ash to water. In addition, all the same safety precautions taken with acid should also be taken with soda ash. Baking soda is a very common chemical found in virtually all households. It’s also used in swimming pools in a limited capacity. Baking soda is a “weak” base, and because of this, it’s an excellent means to control total alkalinity (discussed in Section 4). Unlike acid and soda ash, baking soda is relatively mild and generally does not irritate human tissues. However, since it does react with acid in a somewhat violent manner, care should be taken to avoid mixing baking soda and acid in any environment other than the swimming pool. to the concentration of hydrogen (acid) in the water but the scale is somewhat in reverse. The scale actually ranges from a low of zero to a high of 14, but only the range from 6.8’to 8.2 is of concern for swimming pools. Water with a pH of zero is said to be pure acid, while water with a pH of 14 is said to be pure base (or alkali). A 7.0 pH indicates neutral water, meaning it has neither too much acid nor too much base. Muriatic acid has-a pH of approximately 1.0, while soda ash has a pH of approximately 13.0. Water with a pH of 6.0 is 10 times more acidic than water with a pH of 7.0, and the same is true for the alkaline side of the scale. Thus, it’s imperative that the pH be kept within proper levels to ensure the safety of the swimmers, and the longevity of the pool equipment. The ideal level for pH is generally the same for all swimming pools, regardless of climate, amount of use, temperature, or pool surface. This ideal level falls between 7.4 and 7.6 for all pool surfaces. There are two important reasons for this ideal level. First, chlorine is most efficient at a pH of 7.0, when there is neither too much acid nor too much base to interfere with its function. However, the pH of human blood is approximately 7.42, and thus a 7.0 pH would cause discomfort to swimmers. Thus, it’s recommended to keep the pH as close to 7.4 as possible. Also, to ensure that no corrosion of the pool surface takes place, a slightly higher pH is needed, and thus the ideal range for pH is between 7.4 and 7.6. For most pools in Arizona, it’s generally not too difficult to keep the pH within this range, and only slight amounts of acid and/or soda ash are required. During the warm summer months, the pH of the swimming pool can change rapidly. For this reason, it’s advisable to test the pH level daily during these times. The specific time of day at which the pH should be tested is not as critical as that for chlorine, but for convenience, both should be tested at the same time, namely late afternoon. n addition to the addition of acid and soda ash by the user, there are several other factors, which can vary the pH of a swimming pool. Among these are the presence of citrus plants, rain, dirt and debris, and the type of pool surface present. As mentioned earlier, citrus plants contain a powerful acid called citric acid. Once this acid is introduced to the pool water, it lowers the pH, frequently to a large degree. In some cases, the amount of citric acid added to the water in this way is severe. In this case, it’s advisable to keep as many leaves and citrus fruits out of the pool water as possible, whether by eliminating or relocating the plant, or by adding a cover to the pool. In urban areas where a significant amount of air pollution exists, the rain, which falls, brings with it a significant amount of sulfuric acid. The pH of the rainwater in our area has been measured as low as 4.0, and this level is easily enough to lower the pH of the swimming pool an appreciable amount. It’s important to test the pH as soon as possible after a rainstorm to ensure that it does not remain below ideal levels for an extended period. Some soils, especially those in the dry land area, are very alkaline. Since alkaline substances neutralize acid and raise the pH of water, the presence of large amounts of dirt and debris in the swimming pool can increase the pH significantly. In cases where large amounts of dirt and debris are entering the pool water, it’s advisable to keep the pool covered as much as possible. The type of surface used on a swimming pool can also affect the pH of the pool water. 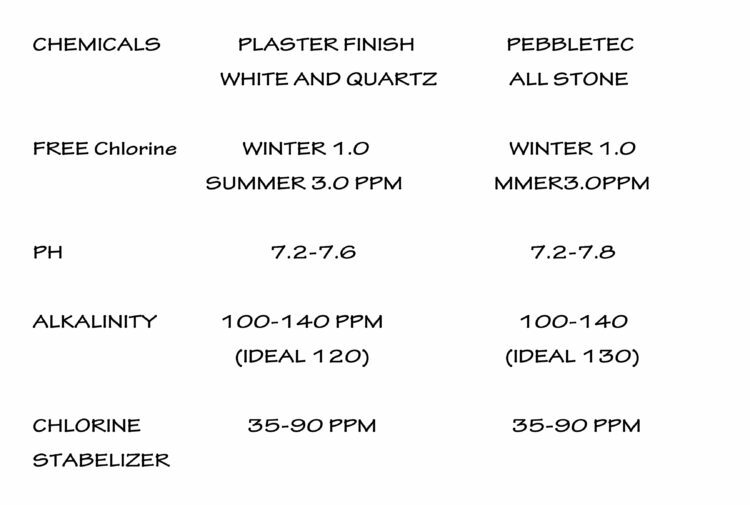 Plaster or plaster based pool surfaces such as Pebble Tec, are porous, alkaline materials. They can absorb and neutralize acid in pool water, thereby raising its ph. In this case, small amounts of acid are generally needed to maintain a proper pH balance. Fiberglass, vinyl, and painted plaster pools, on the other hand, do not have porous surfaces, and thus do not absorb or neutralize acid in the water. Here, small amounts of soda ash or baking soda may be needed to keep the pH at a proper level after acid is added in the form of rain, citrus leaves, etc. Total alkalinity is a measure of the total number of dissolved particles in the water whose pH is higher than 7.0. For this definition, a particle is any object that does not break down completely when dissolved in water. Examples of particles include dirt, sand, and baking soda. Baking soda, unlike soda ash, does not break down completely, but instead remains as a compound and stays in the water for an extended period. Alkaline particles in pool water, at certain levels, act as a buffer to prevent rapid changes in the pool’s ph. Thus, when the total alkalinity of the pool water is within the ideal levels, the pH of the water will tend to stay balanced for longer periods of time. Alkalinity: See “Base If in section above. Buffer: A buffer is a substance, which prevents rapid and large changes, usually in the pH of the environment it’s LT}. In this case, the alkalinity of the water itself helps to minimize rapid changes in the pH of the water when reasonable amounts of acid are added. Total alkalinity is-measured in parts per million (ppm). The scale by which it’s measured begins at zero ppm and has no upper limit. Generally, the maximum level concerning swimming pool users is on the order of 200 ppm, but the recommended ideal levels fall well below this amount. The ideal level for total alkalinity varies with the type of surface the pool possesses. For all pool surfaces, the recommended level falls between 120 and 140 ppm if any trichlor, gas, or liquid chlorine, or bromine tablets or sticks are used, and 100-120 is dichlor, liquid chlorine, calcium-or lithium-hypochlorite is used. *We recommend 120 ppm’s of alkalinity, no matter what form of chlorine is used. Unlike chlorine and pH, total alkalinity does not need to be tested daily, since it does not change rapidly. it’s generally recommended to test the total alkalinity 2 to 4 times per month throughout the year. However, if the pool’s pH is not remaining balanced, or large amounts of acid, soda ash or baking soda have been added to the pool, it’s advisable to have the total alkalinity tested as soon as possible. There is no specific time of day at which the alkalinity should be tested but, again, for convenience, it’s recommended that it be tested at the same time as the chlorine and pH tests. s mentioned earlier, citrus plants contain a powerful acid called citric acid. Once this acid is introduced to the pool water, it lowers the pH, frequently to a large degree. In some cases, the amount of citric acid added to the water in this way is severe. In this case, it’s advisable to keep as many leaves and citrus fruits out of the pool water as possible, whether by eliminating or relocating the plant, or by adding a cover to the pool. The type of surface used on a swimming pool can also affect the pH of the pool water. Plaster or plaster based pool surfaces such as Pebble Teck, are porous. They can absorb and neutralize acid in pool water, thereby raising its ph. In this case, small amounts of acid are generally needed to maintain a proper pH balance. Fiberglass, vinyl, and painted plaster pools, on the other hand, do not have porous surfaces, and thus do not absorb or neutralize acid in the water. Here, small amounts of soda ash or baking soda may be needed to keep the pH at a proper level after acid is added in the form of rain, citrus leaves, etc. Conditioner is a chemical, which, to a certain extent, protects the chlorine from ultraviolet (UV) rays from the sun. Since UV light is partly responsible for the degradation of chlorine in pool water, conditioner helps to keep chlorine in the water for longer periods of time. Conditioner is generally added once after the pool is filled with fresh water, but if an excessive amount of water has been lost due to backwashing or a leak, it’s recommended to have the conditioner level tested. Conditioner is a name given to a chemical which inhibits the degradation of chlorine by UV light. Other commonly used names for conditioner include: stabilizer, sun-shield, the chemical name cyanuric acid, or the trade name Pad-Con. Stabilized Chlorine: Stabilized chlorine refers to chlorine, which is made with a base of conditioner. The chlorine binds to the conditioner base, and as the chlorine dissolves, it leaves conditioner behind. The presence of conditioner in the chlorine serves two purposes. It affords a small amount of protection to the chlorine from UV light, and it also acts to supplement the pools conditioner level, as it’s gradually reduced by backwashing and splashing. Chlorine, which contains conditioner, is usually marked with the words “Sun-Shielded”. Usually, only tablets and some granular chlorines contain conditioner. Unstabilized Chlorine: Unstabilized chlorine refers to chlorine, which does not contain conditioner. This type of chlorine is generally used a method of super chlorination, and is not recommended as the primary source of the swimming pools chlorine residual. Conditioner is measured in parts per million (ppm). The scale begins at zero ppm and has no upper limit. Generally, the maximum level concerning swimming pools is on the order of 200 ppm, but the recommended ideal range is well below this amount. The recommended ideal level for conditioner in a swimming pool is between 40 and 100 ppm. It’s advisable to begin the summer season with a level which is near 40 ppm and allow the conditioner present in the chlorine itself to raise the level toward 100 ppm throughout the season. If chlorine used is not stabilized, small amounts of conditioner may be required to maintain an average of 70 ppm. Since the concentration of conditioner does not vary, it’s usually required to test it only once per month. If a large chlorine demand is noticed, it’s advisable to have the conditioner level tested as soon as possible. There is no specific time of day at which the conditioner level should be tested. he same problems associated with hard water in household pipes, namely scale buildup, can be magnified many times in a swimming pool environment. Once hardness levels become high, scale may form on the pool tile, the pool surface, and even the pipes and equipment. Unfortunately, the causes of hard water in swimming pools are, for the most part, unavoidable. To begin with, the tap water used to fill a swimming pool contains a certain amount of calcium, the main component of hard water. it’s the calcium in the water, combined with alkaline particles, which produces the visible scale buildup. Usually, the concentration of calcium in the tap water is well within, or even below, the recommended levels for swimming pools, but as the water in the pool evaporates, the calcium is left behind, since it’s much heavier than the water itself. As the pool is being refilled, more calcium is being added through the tap water, and thus the concentration of calcium in the swimming pool increases. The level of total dissolved solids (TDS) in the pool is not as important as that of calcium hardness. TDS is usually used as a tool to determine the general condition of the pool water in terms of how many dissolved particles are present. As the water remains in the swimming pool for extended periods of time, particles accumulate and eventually become so plentiful as to interfere with the function of the pool’s chemicals, as well as to cause significant loss in water clarity. Water Hardness: Water hardness is a measure of the concentration of minerals, primarily Calcium, present in the pool water. Water hardness is also referred to as calcium hardness, and at high levels, can cause scale buildup. Total Dissolved Solids (TDS): TDS is a measure of all the dissolved particles in the swimming pool water. These include calcium, manganese, copper, iron, other trace metals, total alkalinity, conditioner, and all substances not totally broken down by the pool water. A tool is generally used to determine the overall condition of the water and to determine whether the water should be removed and replaced with fresher tap water. The Water Hardness and TDS Scales Water hardness and ms are both measured in parts per million (ppm). Both scales begin at zero ppm and have no upper limit. Generally, the maximum levels concerning swimming pools are on the order of 1000 ppm in the case of water hardness, and 2000 in the case of TDS. The recommended ideal levels of water hardness and TDS are 200-400 ppm and 400- 1500 ppm, respectively. The lower limit for water hardness is necessary to ensure the longevity of pool plaster and any metal components in direct contact with the pool water. Since pool plaster is composed partly of calcium, it’s possible for soft pool water to pull the calcium from the plaster, causing degradation of the pool surface. Other pool surfaces, such as fiberglass, also contain some metals in them, and these metals would be removed in the presence of soft pool water. For these reasons, it’s not recommended to add soft water in large amounts to the swimming pool. Concentrations of calcium higher than 400 ppm can cause scale buildup along the tile line, and on the surface of the pool itself. These scale/deposits begin to appear as simply a rough surface finish, but as they progress, they darken to eventually resemble a brownish stain with a rough texture. Low TDS levels are usually present only in soft water, and are not a major concern in ordinary tap water. It’s not possible to have a lower TDS level than that of calcium, since TDS is partly composed of calcium, thus if the calcium is within the recommended ideal levels, the IDS should follow suit. High TDS levels, on the other hand, may cause a lack of water clarity, even if the calcium concentration is within ideal levels. If persistent cloudiness of the pool water is observed, the TDS level should be tested as soon as possible. Since the evaporation rate is highest during the summer months, it’s advisable to have the water hardness and TDS levels tested twice per month during this time. During the Off-season, testing for these levels once per month is sufficient. There is no specific time of day to test for water hardness or TDS. Some types of chlorine contain relatively high levels of hi-products, including calcium. It’s advisable to check the ingredients for the presence of such by-products and avoid them whenever possible. It’s always best to use chlorines possessing high amounts of available chlorine, that is, the actual amount of usable chlorine in the container. The highest amount of available chlorine is usually 89%, found in most tablets and some granular chlorines. Some filters, such as sand and diatomaceous earth (D.E. ), are backwashed, or cleaned, using the pool’s existing pump. During this process, some of the pool’s water is lost, and thus, so are some of the calcium and other minerals in the pool water. When done frequently, this can help to keep the water hardness and ms levels within ideal levels. Other filters, such as cartridge filters, do not use this method of cleaning, and thus the pool water is not cleansed of minerals as it’s with sand and D.E. filters. In this case, water hardness and TDS levels can climb at a more rapid rate. * Always remove all dirt and debris from all pool surfaces before you shock the water to prevent staining. Always use a sodium-based chlorine to shock or super chlorinate the pool to prevent rapid calcium build-up. Remember to also clean out skimmer baskets. ADR canister, filter baskets etc., on a regular basis. Care should be taken to ensure that as little dirt and debris as possible enter the pool water. The presence of metals such as copper and iron can increase the TDS level of the pool water. If large amounts of these metals are entering the swimming pool, steps should be taken to eliminate their source. The presence of copper and iron in pool water can lead to damage or discoloration of the pool surface, and corrosion of metal components in direct contact with the pool water. Any time metal objects such as poles, toys, and tools fall into the swimming pool, they can release iron and copper into the pool water. These “local” deposits of metal could cause a discoloration of the pool surface in that area. Also, some common algaecides used in swimming pools contain moderate amounts of copper, and when used in excess, can cause staining (usually blue or green) of the pool surface. High concentrations of iron can cause general rust spots to develop over large area of the pool surface. Copper and iron are both measured in parts per million (ppm). The scale begins at zero ppm and has no upper limit. Generally, the maximum level of copper and iron concerning swimming pools is on the order of 1.0 ppm. The recommended ideal levels of copper and iron in swimming pool water are both zero ppm, since the -presence of these metals can cause problems as explained above. However, some pools are equipped with devices, which introduce copper into the pool water in small amounts to reduce chlorine use and prevent certain types of algae buildup. In these cases, it’s recommended that a copper concentration of approximately 0.2 ppm be maintained. Since the concentrations of copper and iron do not change rapidly under normal circumstances, testing for these metals once per month is generally sufficient, unless a copper ionizer is used as a source of sanitizer. In this case, follow the ionizer manufacturer’s directions. However, if persistent general staining is observed, it’s recommended to test for copper and iron as soon as possible. There is no specific time of day to test for these metals. Without proper chemical care, algae spores, which enter the pool water from the air, will multiply and become visible colonies. These colonies can take several forms and are identified by their colors. Of the many species of algae, only four are common in household swimming pools: green, yellow, pink and black. Green algae is by far the most common type of fresh water algae. It can grow both on the pool surface, resembling a green, slimy stain, and suspended in the pool water, causing the water to appear to have a green tint. In severe cases, the algae are concentrated enough so that it’s impossible to see the pool bottom, or even the steps. This can occur without significant warning during the summer months and may even happen within a 24-hour period. For this reason, it’s always advisable to make certain that the chlorine concentration is well within the ideal range. Yellow algae (also called mustard algae) is a type of green algae, but because of its different appearance and somewhat more difficult removal procedure, it’s discussed separately here. Yellow algae almost always form on the pool surface, usually in shaded areas. It’s yellow-brown in color, has a slimy texture, and can most often be brushed away with a few vigorous strokes of a standard pool brush. Pink algae is a relatively uncommon type of algae that is ink or red in color, and usually form around pipe fittings and light fixtures on the pool surface. Black algae is a very common type of algae, and is the most difficult to remove once it has formed, A colony of black algae always forms on the pool surface, and usually is first visible when it’s about the size of a small fingernail, but can grow rapidly and eventually become larger than a dinner plate. The spores settle in porous surfaces, such as rough plaster (mostly caused by calcium buildup), and begins to anchor itself to the surface. It can dig a root into the porous surface and from there can develop an extensive root network beneath the pool surface, usually between the plaster and the concrete. Once the root has been formed, the algae become visible, but now it’s already too late. Destruction of the visible portion is by no means a guarantee that the entire. colony is destroyed. The proper maintenance of pool chemicals is the best way to ensure the prevention of most types of algae. Some green algae, and virtually all yellow algae are immune to chlorine, so in these cases it’s almost impossible to guarantee the prevention of all algae. However, there are algaecides available to the consumer, which use both chlorine and copper to collectively destroy these chlorine-immune algae. Black algae can most easily be prevented by ensuring that the pool surface is as smooth as possible. Maintaining a proper water hardness level, and ensuring that any damage to the pool surface is repaired as soon as possible are the best ways of keeping a smooth pool surface. Once algae have become visible to the naked eye, it will require a great deal more time and expense to kill it than it would have to have prevented its formation. For this reason, the prevention of algae is stressed. Except for black algae, the destruction of algae means the total eradication of the colony from the swimming pool, and the pool is to be maintained as usual from that point on. With black algae, as mentioned above, the visible portion may have been removed, but a root still exists until at least a liquid chlorine bath can be performed, requiring the pool to be drained and scrubbed with liquid chlorine.